Suzuki introduces the all-new 2013 RM-Z450 motocrosser in the Australian market. 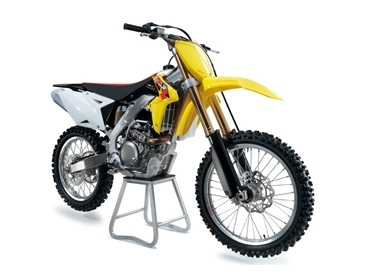 The fifth generation of Suzuki's cutting edge open class, championship-winning, 4-stroke motocrosser, the all-new 2013 RM-Z450 motocross bikes are packed with substantial upgrades to win bar-to-bar battles. Chosen by champion riders, the 2013 RM-Z450 continues the legacy of its ground-breaking predecessors with new engine upgrades, Showa Forks, exhaust and frame. Developed and tested by factory race teams, the all-new piston is 13% lighter with the piston pin featuring a Diamond-Like Carbon (DLC) surface treatment, which increases durability and lowers friction. The RM-Z450's 449cc, 4-stroke, liquid cooled, DOHC, 4-valve, fuel-injected engine has been overhauled and refined to deliver phenomenal idle-to-redline thrust with increased acceleration, faster throttle response and broader mid-range power and torque. The new motorcycles feature two couplers for the rider to fine-tune fuel preferences to suit track conditions by simply changing fuel settings between three fuel maps (lean, standard and rich) with the rich-lean coupler relocated for easier access and change without tools. The new 48mm Showa Separate Function Fork contains the spring on the right leg, while the left leg incorporates the cartridge assembly to manage damping, resulting in less friction, increased damping and lower weight.